The full range of Sasak Pots are now available at Bunnings stores throughout Australia. You’ll find all sizes and colours in the Bunnings Pots section of their garden area. 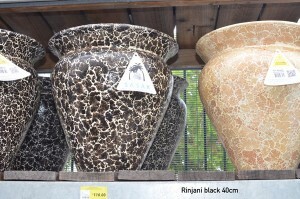 The Rinjani style Sasak Clay Pots come in Cream and Black colours and the sizes available are 62cm, 60cm, and 40cm diameter sizes. Check out the range at our products page.